Good die design is absolutely fundamental to the success of any diecasting company. The most advanced manufacturing facilities and techniques cannot compensate for inadequate die design. of High Productivity and Low Reject Levels. During the design stage of this automotive Bulb Holder, Presbar made a wooden model in large scale in order to facilitate discussions with the customer's engineers. 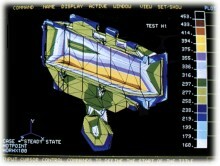 The model aided the correct orientation and split line choices for the die, and a few design modifications to the component. A six cavity die was made complete with a six impression trim tool including a side actuating trim for the two small holes in the face - saving a drilling operation. Over two million parts were successfully produced of the bulb holder which was fitted to a popular saloon car. In addition to die design we work in partnership with our customers to assist in the design of the component. "Design for Manufacture" is given great importance at Presbar. 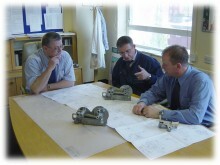 We are experienced in taking brief design outlines and developing castings suitable for "Capable" production. Presbar is a world leader in advanced die design, achieved with the help of powerful computers and simulation software, which permits modeling of the most complex dies. Presbar has a very well equipped toolroom, capable of any required work on diecasting dies and trim tools. Most modifications and maintenance is carried out internally by our own experienced toolmakers.